Well here I am in Cooktown, as you can see from the map above I am a long way away from my home in Melbourne. 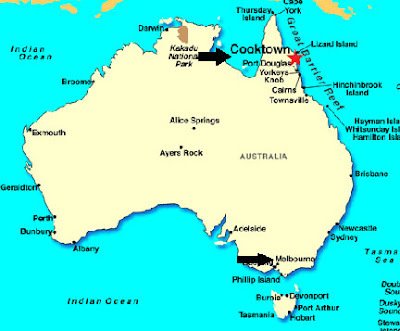 Cooktown is the northernmost town on the east coast of Australia, and located at the mouth of the Endeavour River, on Cape York Peninsula. This small town is famous for being the home to Captain James Cook on his first journey of discovery up the north eastern coast of Australia after running aground in his ship HM Bark Endeavour in 1770. With a population of about 2000, Cooktown is relatively small but also acts as a service centre for the surrounding Aboriginal communities of Hopevale and Wujal Wujal. Tomorrow I am going on an Aboriginal Rock Art Tour with Nugal-warra Elder, Willie Gordon of Guurrbi Tours. I have wanted to do this type of tour for many many years, and I am so excited. I think my camera will be working overtime. “Davine Time” update: I feel today I have had another success in my “Pilgrimage to Self Discovery”. I also feel the most positive about my life’s journey I have felt in a long time. Thanks for the map...Australia is a mystery to me.....I am fascinated with aboriginal art so hope you will be showing us some....looks like an adventure! Have you read Bill Bryson's In a Sunburned Country? I loved it. It sounds like an amazing place. Have lots of fun...cant wait to see the pics.